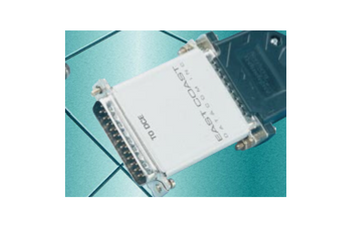 The 232-X21 Interface Converter is designed to provide signal level conversion between RS-232 DCE (Modem) equipment and X.21 DTE (Terminal) equipment. The 232-X21 transmits data bi-directionally at data rates up to 128kbps. The device has no switches or straps to configure. Ideal for Local Area and Wide Area networks the 232-X21 interface converter is line powered and requires No AC power source. Utilizing new silicon chip technology this device requires less than 7ma for operation. This equates to savings in your power requirements and with battery backup at your data center. Applications that can benefit from the 232-X21 are LAN-WAN connectivety, video conferencing, Adaptation of older model test equipment and new high speed Modems connecting to X.21 DTE equipment. The 232-X21 is protocol independent and passes all appropriate Data, Clock and Control Signals. For maximum flexibility to your system requirement, the 232-X21 is available in Male or Female X.21 genders. The 232-X21 is housed in a sturdy metal enclosure and will provide in excess of 100,000 hours of reliable service. The 232-X21 has a three year warranty and a 24 hour turnaround on warranty repairs. East Coast Datacomm products have been designed to comply with the following Approvals: UL, CSA, CE, CCC, FCC. Prior to connection to any Australian telecommunication network, applicable product Certification is required. a connection rule for this item has been made by the Australian Communications and Media Authority. The connection of this item to any telecommunications network or facility may cause a hazard or damage to the network or facility, or to users of the network or facility, and may result in you being consequentially liable to pay substantial compensation.